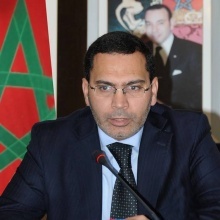 Mustapha Khalfi was appointed by H.M. King Mohammed VI as the Minister of Communications and the Government's Spokesperson in 2012 and during the government reshuffle in 2013. He is also a member of the general secretariat of the Justice and Development party and a member of the executive office of the Uniqueness and Reform Movement. Mr. Khalfi has been practising journalism since 1997 and has served as editor-in-chief and then publisher of the Moroccan daily newspaper "ATTAJDID". He is also an active member of the Moroccan Federation of Newspaper Publishers. In 2013, Mr. Khalfi presided the Diplomatic Conference in Morocco, a high-level event which concluded successfully with the adoption of the Marrakesh treaty to facilitate access to published works for persons who are blind, visually impaired, or otherwise print disabled. Mustapha Khalfi is the founder and former director of the Moroccan Centre for Contemporary Studies and Research (a public policy think-tank). He also functioned as a researcher in several international organizations: the Centre for Islamic Studies in Oxford, the American Institute of Advanced International Studies and the American Political Science Association. Mr. Khalfi holds three Bachelor’s Degrees: in physics, law and Islamic studies, and a Master's degree in political sciences. Furthermore, he is a Ph.D candidate in the Anglo-American approaches to Islamic movements. Mr. Khalfi acted as a visiting scholar in Carnegie’s Democracy Rule of Law project, where he analyzed political reform trends in the region and the changing role of the Islamist movements and parties.